Telekom.hu Review 2019: Is Telekom.hu a Good Hosting? Telekom.hu is the website of Hungarian company Magyar Telekom, through which it sells a wide range of products and services from mobile phones to web hosting. Telekom.hu is the website of Hungarian company Magyar Telekom, through which it sells a wide range of products and services from mobile phones to web hosting. This company sometimes abbreviates its name to simply ‘Telekom’, so I’ll do the same to save myself some typing. Telekom’s solutions include colocation services, shared web hosting, and virtual servers. It is among the top 20 web hosting companies in Hungary by market share, and it also has a significant presence in Germany, the United Kingdom, Austria, and Slovakia. When it comes to web hosting information, this company’s website is only in Hungarian. The company has invested in high-quality servers and has housed them in modern data centers that have a guaranteed electricity supply and physical security. 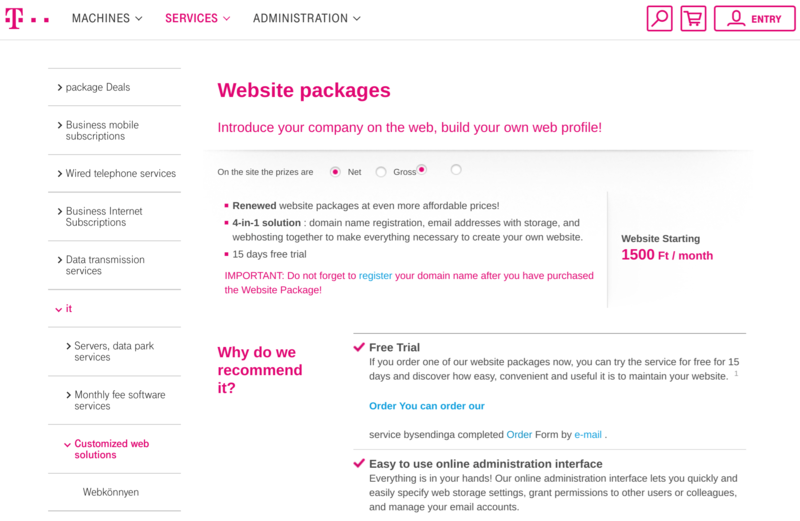 Telekom markets a 4-in-1 solution comprising domain name registration, email addresses with storage, and web hosting. There are four web hosting packages, with the lowest Homepage Beginner package including 100MB storage, 1 email account, and 2GB email storage. The highest Website Premium package includes 1GB storage, 60 email accounts, 120GB email storage, multiple domain names, secure SSL encryption, MySQL and MSSQL databases (not to mention the ability to stream audio and video). There are also three VPS packages named Virtual Server Light, Virtual Server, and Virtual Server Plus, but you’ll be hard pressed to find them on the vendor’s website. The Virtual Server Light starter package comes with 512MB RAM, 50Mbps bandwidth, 20GB HDD (redundant), and 15GB external FTP storage space. This company also leases and sells servers and server space in its data centers, for which a remote management service allows you to access your servers 24/7. 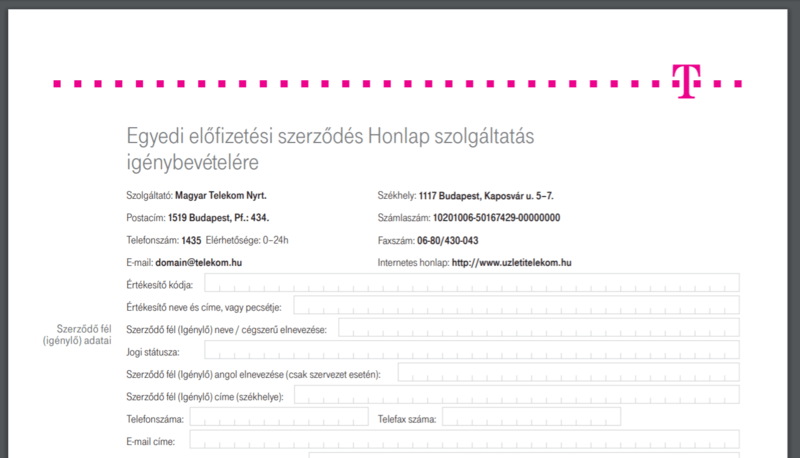 As already hinted, Telekom’s website is exceptionally hard to navigate, especially if you don’t speak Hungarian, but even if you do. If I didn’t dig deep into the bowels of the website, it would have been easy to conclude that this vendor doesn’t offer web hosting at all. While Telekom’s hosting plans might seem pocket-friendly at first glance, a closer inspection reveals that they are actually quite expensive when you consider the few features and notable limitations. That said, Telekom’s hosting plans are adjustable and easily scalable, making them ideal for fast-growing enterprises. And new customers get a 30-day free trial, but the only way to get it seems to be by filling out an order form in Hungarian. You can contact Telekom’s 24/7 support team by phone, email, live chat or social media channels. I was impressed that they responded to my query email in just over an hour with some pretty helpful solutions. Unfortunately, there is no knowledge base. Telekom’s web hosting solutions are designed for businesses of all sizes. Although this vendor has captured less than 1% of the hosting market in Hungary, its powerful hosting infrastructure allows them to keep expanding even beyond the Hungarian borders. Buy hosting or server placement solutions from Telekom.hu! Wondering how Telekom.hu stacks up against other Web Hosting companies? Enter any other Web Hosting company and we will give you a side-by-side comparison.